My work computer recently hanged when shutting down to sleep mode. When booting the computer the next day I realized that it had eventually crashed. This happened again after disabling hyper-threading, so I decided to investigate. The computer has rebooted from a bugcheck. The bugcheck was: 0x0000009f (0x0000000000000003, 0xfffffa800cd5e060, 0xfffff80000b9a3d8, 0xfffffa802e232590). A dump was saved in: C:\Windows\MEMORY.DMP. Then checked Properties. 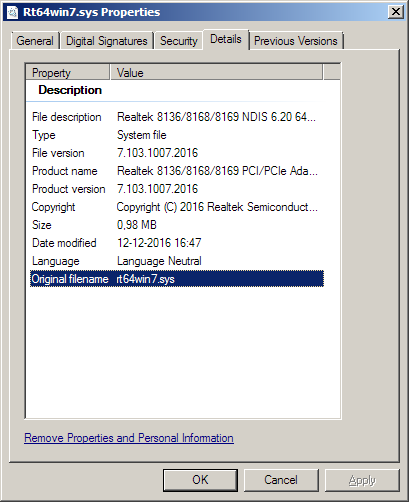 The details view confirmed that the driver was for the Realtek network interface card, version: 7.103.1007.2016. Decided to look for a newer driver from Realtek. Found, downloaded and installed the current latest version 7.109. Unfortunately this was not the solution, the problems continued. However, later on I discovered that adjusting power options seemed effective.